This plugin fills a specific hole in Lightroom's “Grid Filter”, adding new fields by which you can filter images: “Focal Length” and “Focal Length in 35mm”. “Focal Length” is the raw focal length of the lens, while “Focal Length in 35mm” is viewed in terms of the frame size of a 35mm film frame. With “full frame” pro cameras these values are the same, but they differ for most cameras. The 35mm version allows one to normalize the focal-lengths across cameras, judging general “field of view” without regard to the specifics of the camera. This is similar in concept to my “Megapixel Sort” plugin, and a more explicit way to look at focal-length data than my “Data Plot” plugin. Unfortunately, the Lightroom plugin infrastructure does not yet allow for custom metadata to be created and updated automatically, so as you import new images to your catalog, you must explicitly tell the plugin to calculate these custom fields. This plugin adds two items to the File > Plug-in Extras menu, “Calculate Focal-length Sort” and “Calculate Focal-length Sort for Entire Catalog”. The former calculates the two custom-metadata values for each selected image, while the latter does it for every image in the current catalog. Note: Focal lengths less than 10mm are rounded to the nearest tenth of a millimeter. After that, focal lengths up to 200mm are rounded to the nearest millimeter, while ones beyond that are rounded to the nearest even 5mm mark. You can't actually sort via focal length, even using this plugin, but you can use the Library Filter to do something close. The Library Filter is in the Grid Module; use the “/” key to bring it into view if it's not already visible. 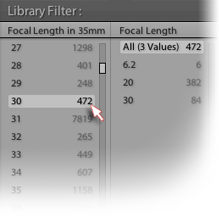 In the Library Filter, select “Metadata”, then click on one of the column heads and select either “Focal Length” or “Focal Length in 35mm”, depending on you want to view the data. You should then be presented with a list of focal lengths that apply to the currently-visible images. You can then click on one of the focal lengths to isolate only the associated images. Fixed the "post-crop focal-length 35mm equiv" data calculations. Updated some Phase One data. Fixed the crop-factor data for the Canon 5D Mark IV. Added a bunch of cameras to the crop-factor database. Added some Canon cameras to the crop-factor database. Added some Sony/Casio cameras to the crop-factor database. 20160112.75 Added data to the crop-factor database on the original iPhone, and the HP PhotoSmart 618. 20151221.74 Update to the Canon stuff. Sigh, Canon continues to boggle the mind with their image metadata. It turns out that they released two cameras with the exact same Make/Model identifier, a decade apart. This update now differentiates them so that the 35mm-equivalent focal length can be calculated. 20150728.71 Had the wrong data in the crop-factor database for the Fuji X100s. Fixed that, and added some other recent Fuji cameras. In the POODLE-vulnerability dialog, display a raw URL of a page on my site that discusses the issue, so that folks can be independently sure that the dialog is indeed from me and not malware. Added some special-case sleuthing to try to guess the various Hasselblad H5D crop factors. Added the Canon EOS 7D Mark II to the camera crop-factor database. Added a bunch of Canon cameras to the crop-factor database. 20141019.64 Windows Only: Add a one-time check for the POODLE security vulnerability, and alert the user if it exists. 20140710.56 Sigh, had a bug in the Creative-Cloud support. 20140704.54 Sigh, introduced an error for some folks with the rebuild the other day. 20130925.48 Updated the camera crop factor database. 20130910.47 Added a bunch of cameras to the crop-factor database. 20130830.46 Added a few more cameras to the crop-factor database. 20130613.43 Better support for plugin revalidation. Corrected the crop-factor data for the Canon Powershot G1 X. Added crop data for a bunch of Ricoh cameras, some Canon, and another Fujifilm. 20130524.39 Apparently, a recent change broke things on Lr2, which some folks apparently still use. 20130330.36 Added some Ricoh cameras to the crop-factor database. 20130328.35 Fix for the registration system. 20130124.31 Added a bunch of Canon cameras to the crop-factor database. 20120608.30 Fix an "attempt to perform arithmetic on field" error. 20120428.28 Added another Canon camera. Added some recent Canon SLRs. It's unfortunate that I have to do this, since there's a perfectly good Exif field for them to indicate the 35mm-equiv focal length, but Canon doesn't use it. Sigh. 20120325.25 Added a bunch of Canon compacts to the database, and fixed a few that had been incorrect. 20120312.24 Added some more cameras to the database. 20120309.23 Had broken registrations in Lr2; Update to the debug logging to better track down timing issues that might arise. Added a bunch of data to the crop-factor database. More updates to the internal crop-factor database. I really need to figure out a way to crowdsource this data. 20110908.15 A few updates to the internal crop-factor database. 20110628.14 Updated the internal crop-factor database for the Fuji X100, which doesn't seem to include its crop factor in its metadata. 20100829.13 Made the revalidation process much simpler, doing away with the silly need for a revalidation file. 20100822.12 Assume any camera-model Exif with 'scan' in it is from a film/slide scanner, and treat as a full-frame size. 20100820.11 Discovered a bug in my plugin build system that caused horribly difficult-to-track-down errors in one plugin, so am pushing out rebuilt versions of all plugins just in case. 20100814.10 Added code to allow plugin revalidation after having been locked due to a bad Lightroom serial number. 20100625.9 Yikes, shaking out some more build issues. 20100624.8 Discovered a nasty build bug; pushing a new version in case it affects this plugin. 20100516.5 Update for the Lr3 beta. 20091205.3 Minor internal debugging tweaks. 20091126.2 Added two more custom metadata fields, "Cropped" (yes or no) and "Post-Crop Focal Length 35mm", which indicates the effective focal length (in terms of a 35mm camera) of the crop. If there's no crop at all (or no crop on one of the sides) it's the same as "Focal Length 35mm". Otherwise, it's larger. You seem to be reading my mind… just last weekend I was thinking of a way to convert crop to effective focal length. Thanks for yet another useful plugin! This plugin is more than welcome. Works like a charm! So happy to find this. Is there a way to print out the focal length breakdown that shows in the Library Filter? I use this plug-in and discovered that in some cases it displays a question mark (?) if the image does not have the FocalLengthIn35mmFormat label defined. Upon clicking on the ? line, the images that do not have that label are displayed (filtered). This is working as expected. However in some cases there another entry “No Value” which is always at the bottom of the. Upon clicking that entry the line is highlighted but the filter is not engaged, the same set of pictures is displayed. Thus, I can not determine what metadata tag is involved. This is not a big deal, but it is in all likelihood a bug that you might want to eliminate at some point. Jeffrey, this issue is solved under LR 3, thanks. Just out of curiosity: are you using the FocalLengthIn35mm EXIF variable in any way? How do you compute the value, if not? Would it be possible to write back the computed value into the metadata of the image? I am messing with a couple of small cameras that do not provide the FocalLengthIn35mm and need to massage them using exiftool. Amazingly, it is possible to at least display that variable (using your metadata config tool: ‘com.adobe.focalLength35mm’), but it is not possible to sort on it or put it in a smart collection. I was wondering if your variable is related to it and how. And again, it would be very convenient if your plugin could write back the computed value into the image (or at least into the FocalLengthIn35mm variable in the database). I see. What a pity. How often can you update the database? My new little cam is apparently not in it yet (FujiFilm FinePix JZ300). When I run “Calculate focal length sort” on it, the FocalLength in 35mm changes from “No value” to “?”, I take that’s because there is no entry for it in the database. The plug in does not work for me. I have registered and done everything you suggested. I am using LR4. It shows me in the metadata filter all the camera, lenses and focal lenght I have used so far, but when I click on a single camera, lens or focal lenght it says that no phot match the filter. I have calculate the focal lenght for the entire catalog, disable and enable the plug in , close LR and relaunched but nothing seems to work. Am I missing something? I would really like to see a Lightroom plugin that crops an image according pre-defined focal lengths. When you have an image shot with a 24mm lens it is not possible to see when 35mm, 50mm, 70mm or whatever focal length, is reached during cropping. It is possible with the focal-length sort to see it but only after cropping and that is a bit laborious. I just installed the Focal-Length Sort plugin, which is a godsend for me as I have used many small-sensor cameras over the years and until now have had no idea what focal length equivalent I was shooting at. After running it on my catalog, I noticed that all my Ricoh GRD2 images came up with question marks (? ), which I take to mean that the GRD2 isn’t in your database. It has a fixed 28 mm equivalent lens, so a) can you add it to your database, and/or b) is there a way for me to manually edit the image files in my catalog to insert “28” in the correct field (e.g. using an EXIF editor and then instructing LR to read the updated metadata from the file)? Thanks! BTW, I noticed your comment above that this isn’t a popular plugin. Maybe if you changed the name to better describe what it can do, more people would check it out. I would suggest calling it “Focal Length Calculator,” as IMO the calculator function is the key feature and the sort function is just a by-product. I like that the plugin a) will insert the focal length equivalent for cameras that don’t add it to the image, and b) will calculate the post-crop focal length. I am using it in combination with your metadata preset plugin to display the focal length equivalent and post-crop focal length in the metadata panel. I ran into a glitch today with the plugin. I ran it on an image from a Micro 4/3 camera shot at 21 mm, and it correctly reported an equivalent FL of 42 mm. I cropped the image slightly, so it also reported a post-crop equivalent FL of 44 mm. After adjusting the image in LR, I opened it in Photoshop for some final retouching. When I later ran the Focal Length Sort plugin on the resulting TIFF file, it correctly calculated the equivalent FL as 42 mm, but calculated the post-crop FL as 42 mm also, not 44 mm as it did for the raw file. Any idea as to why it didn’t calculate the post-crop FL properly for the Photoshop image? How can add more cameras to the crop-factor database? Can you add the Fujifilm XF1 to the database? The manufacturer website for the camera is http://www.fujifilm.com/products/digital_cameras/x/fujifilm_xf1/, and you can download a sample image at http://tinyurl.com/p7vns2c. Thanks! Can you add smartphones to your database? 🙂 With iPhone outnumbering any other camera on Flickr, smartphones may deserve better treatment with LightRoom too. Alternatively, can you let the user add custom info to the database so they can add the crop factor for their smartphone? Can you add the Canon G7X to the database? The manufacturer website for the camera is here, and you can download a sample image here. Thanks! Is there a way for us to add our own cameras? I have a couple of old ones that I would like to be included in the calculations of your plugin. I’d be interested in seeing the HP Photosmart 618 and iPhone 3GS added. Those two come up as ‘?’ in the plugin data. I´d like to see focal lengths alternatively sorted normalized to fullformat. Hi Jeffrey! I just noticed that the Focal Length Sort plugin does not correctly calculate the post-crop focal length if the image has been cropped from landscape to portrait or square. For example, I cropped a photo that is 4608 pixels wide by 3456 pixels high to 2592 pixels wide by 3456 pixels high, and the plugin reports the same 24mm equivalent focal length before and after cropping. I assume that this is because the vertical dimension remains the same. Is it possible to have the plugin check both the horizontal and vertical dimensions when calculating the post-crop focal length? Hi Jeffrey! Thanks for responding to my comment about the focal length calculation. Yes, I had thought the plugin would calculate the cropped focal length as if I had rotated the camera 90 degrees. My expectation of “post-crop focal length” is that it is the calculated angle of view and equivalent focal length of the cropped image, regardless of what the original image was. It’s not a situation that arises often, so I have only a few photos where this is an issue, but it would be nice to know what focal length the image ended up being. Thanks for adding Phase One crop factors last year! However, the crop factors for the 100MP IQ3 appears to be incorrect? A Schneider blue ring 240mm lens has a 149mm equivalent (https://www.phaseone.com/en/Products/Camera-Systems/Lenses/Schneider-Kreuznach-240mm-LS.aspx), yet this plugin shows 143mm equiv. With the 2X extender, it should be 298mm but it shows 285mm. Hi, when I click on the plug-in Calculate the Focal-Length Sort for Entire Collection it grinds for a while and looks at my 85,000+ pics. Then when it is done it just goes away. Where is the file? I clicked on / but it only makes the Navigator go blank as well as the detail info on the pics. It did the same thing when I one or several pics. The post-crop focal length seems like a really neat feature, but is reporting between 1 and 5 for “Post-Crop Focal Length in 35mm”. These values seem to correspond to how much the image is cropped, but it doesn’t factor in or multiply by the “Focal Length in 35mm”. The number of Post-Crop FL’s within 1 and 5 equal the number of images with metadata Cropped=Yes. The Cropped Megapixels field from Megapixel Sort plugin does seem to be correctly filled in. On a side note, having a metadata for how much an image is cropped, across source images of different megapixels (what is currently being displayed for me in this plugin, but maybe in a percentage) would be useful to have, is there a plugin with this available? Is it because the g7xii isn’t in the Crop Factor database? If so, could you please at it? 🙂 It has a 1-inch-sensor.